Twists, turns, exotic locations and philosophical insights. Unmissable. I am a big fan of John Dolan’s writing and enjoyed the first book in his new trilogy, Karma’s Children, so much that I started to read the second book straight away. Unfortunately I’ll have to wait a bit for the conclusion… Because yes, it’s another great book. 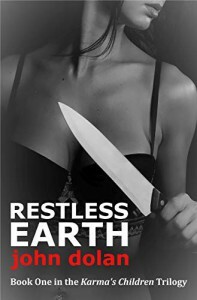 In contrast to Restless Earth (you can check my review here), this book is less complex in structure and reminded me more of the previous series, Time, Blood and Karma, although it would be wrong to state that any of the books by this author are “simple” or “straightforward”. He has built a universe of characters, locations, and events that interconnect in ways that bring to mind a spider web. It is beautiful, complex, and depending on your location you might, or might not, be able to see how the whole structure works. But, back to the structure. Here, the story is told mostly in chronological order (sometimes the characters might recall things from their past, but the actual events in the main story are told in what appears to be the logical order), by two main characters. We have the first-person present tense narration by our hero, David Braddock (well, hero/antihero), and here the narration is much more in tune with previous books, bringing back his wit, his observations, his quotes, but also, his anxiety and his lack of insight at times. (He seems to have taken a page out of my notebook, though, and he shows some evidence of trying to grow up at the beginning of the story). I was pleased to hear from him from his own mouth, as such, even if I must confess that the previous book made me keep my eyes more closely trained on him and question his reasoning and his motives even more than usual. It’s a bit difficult to talk about this book in detail without risking giving away any spoilers. This time, as the description hints at, things get pretty personal for Braddock, and despite the support by the many women in his life (I’ve become a huge fan of Da, and I’m pleased Braddock is giving her more of a free rein) and their mature attitude, he is in turmoil. And, unfortunately, things only get worse. There is a twist at the end (it didn’t surprise me, but I won’t say anything else), and I wonder if some readers might class the ending as a cliff-hanger. In my opinion, we get answers to most of the questions posed in the book, thanks to the two points of view employed and to the ending. Having said that, this is a trilogy, and we are left desperate to know how it will all conclude. And that is as should be. Fans of Dolan’s novels will enjoy the quality of his writing, the philosophical insights (that we might share in or not), the many quotes (Macbeth plays a big part, although references to rivers and the sea brought to mind Garcilaso de la Vega for me), the varied and complex characters, the mystery/thriller parts of the story (I had an inkling that all was not well, but I didn’t quite work out all the details), the contrasting settings (from Thailand, to London, to Marbella, to Bali, beautifully described), and the ending, which opens up more questions and promises a final book where everything will come to an explosive end. I would not recommend readers who’ve never read any of the author’s books to start here. At the very least, I’d advise anybody who wants to get a full sense of the story to read the previous book in the trilogy. And, if you have time, start right at the beginning, reading book one in the Time, Blood and Karma series, Everyone Burns. You’ll thank me later. A must-read for lovers of intrigue, complex characters, exotic settings, philosophical insights and reflections, excellent writing, and stories with red herrings and twists and turns. I can’t wait for the last book! Great characters and settings, a complex mystery and a masterful villain. Another winning series. Another fun and thrilling book in a great series. I received an ARC copy from the author but that has in no way influenced the review I freely chose to write. 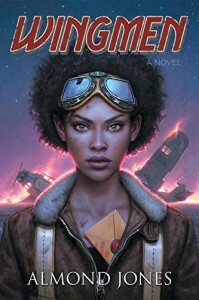 I have read and reviewed the two previous books in Andersen’s series The Great Devil War (you can check my review here) and I loved them. I was more than happy when I heard the next book was ready and due for publication early in April. So, in case you are in a hurry, yes, I loved it as well. I have to add two caveats, though. The first one is a warning for readers who hate cliff-hangers. There is a big one at the end of the book. The book includes a teaser for book 4, and therefore we get a hint of what actually happens next, but the story itself is not completed in this volume. Yes, this is a series and is to be expected that the overall arch of the story will continue and is what happened with the two previous books, but they had a resolution to the main adventure in that particular tome, while that is not the case here. So if you hate cliff-hangers, stay away from this book, as it could make you quite angry. (I haven’t completely made up my mind about the subject. I don’t mind so much if I am sufficiently invested in the story and the characters, as I am in this series already, but if it’s totally unexpected and I don’t care for the characters, I am bound to not return to read the rest). The other caveat is a recommendation. There are enough reminders of Philip’s previous adventures in this novel to allow readers who’ve read the other books a while back to quickly find their bearings, but I don’t think it would work as an independent read, because there would be too much background missing to fully enjoy it. The series does not go into extremes of world-building or descriptions, but by now there is a lot of information and mythology that, although based on common themes and concepts (Heaven and Hell, stories in the Bible), help create an environment that is a big part of its charm. So, if you fancy the sound of it, start with number 1 and keep going. I’ve already said I enjoyed it, as much as the other books at least. We get a bit of exposure to Philip’s everyday life, but that doesn’t last long, and we’re soon back in Hell and with Satina, Lucifer, Lucifax, and the rest of our favourite characters. But there are some new ones as well. We get to meet the artist behind the horrific paintings adorning Lucifer’s castle (paintings where the condemned can be seen suffering and heard screaming), we meet Chimera, a fascinating creature (yes, I want one); we finally get to go to Heaven and meet Jehovah (I won’t give you any hints, but his relationship with Lucifer is… well, entertaining), also visit the garden of Eden, Saint Peter (I loved the fact that when he falls asleep his halo falls off his head), and we visit other underworlds, Hades in this case, and that brings us plenty of Greek mythology to contend with (and great characters as well). There are also the guest star appearances, in Hell and in this case also in Heaven, famous figures from the past that Philip meets in his travels. I will keep my peace, but I particularly liked their encounter with a famous writer whose creations had also come to live. (Yes, Stephen King, be scared!). The story moves at good pace, there is plenty of intrigues, action, betrayals, the quest motif, more than a hint of romance (but nothing explicit), and the humorous touches as well. 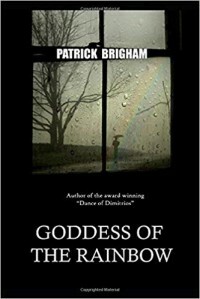 The writing style is fluid and easy (the story is told in the third person from Philip’s point of view, as usual), and the characters are solid and engaging. The novel turns darker towards the end, and although the whole series has never been all light and fun (among the subjects discussed are family losses, reflections on good and evil, religious themes, guilt and its consequences, moral ambivalence, death and mortality to name but a few), the whole book hints at horrific things to come, and even the good things that happen come hand in hand with bad consequences. The main character is growing up and so are his concerns, and that makes it a series definitely worth following and watching for. Any negatives? Well, apart from the cliff-hanger already mentioned, I guess that people who’ve just read the previous two books might feel they don’t need any reminders of the previous stories. (I didn’t find that a problem). I also wondered how well this series would work for young readers of cultures not so familiar with the Bible. I guess it might work as just another fantasy world, but I suspect some of the in-jokes might be lost. Despite the fantastical setting, this is a pretty conventional story when it comes to the main character and his background, so it might not suit readers looking for a more inclusive and diverse kind of storytelling. 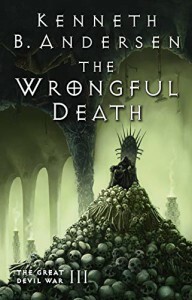 As I had said before, this is a book I’d recommend to readers of fantasy, both YA and adults, but it does have pretty dark moments, there is violence (some behind closed doors), and it will not suit people who prefer light reads or are particularly squeamish. Its take on religion can put some people off as well, but I guess the description of the series gives a clear indication of that. A great read and another gripping visit to the universe of the Devil War. I cannot wait for the next instalment. I was not comfortable with some of the female portrayals and although at first, I thought I'd just comment on them, eventually I thought it would cloud my judgement of the rest of the book. The perfect gift for nature lovers who enjoy amusing trivia, stories, and photographs. Thanks to Rosie and the whole team at Pen & Sword for providing me a hardback copy of this beautiful book that I freely chose to review. I love trees and I can’t imagine living in a place with no trees at all, even if they are not in their natural environment, as is the case in cities. I’m not a connoisseur, although I’ve read some books that featured trees prominently and have enjoyed them, and this volume seemed the perfect opportunity to learn more. This is a beautiful book that would make a perfect present for anybody interested in trees, in general, and UK trees in particular. It is a photographic book, but it also contains a wealth of written information about trees: factual and botanical data, historical events related to specific trees, folk and mythological stories about them, literary connections, etc. As the author explains in the introduction, due to the limits in the length of the book he could not include all British trees, and he selected the ones he felt were not only better known but had also the best tales to tell. Not that I had any doubt about it, but the author makes a good case for his choice of topic in the introduction: “Beyond their practical utility to us and our simple liking of them, trees form the great forests of the world, which are said to be the lungs of the planet. So trees, more than anything else, keep us alive” (Wills, 2018, p. vi). The list of trees included in the book are: alder, apple, ash, bay, beech, birch, cherry, elm, hawthorn, hazel, holly, hornbeam, horse chestnut, lime, London plane, magnolia, maple, monkey puzzle, oak, pear, pine, poplar, rowan, sweet chestnut, sycamore, walnut, willow and yew. This is a book one can deep in and out of as one fancies, or read it cover to cover. I often found myself picking it up just to have a quick look, and discovered an hour later that I was still glued to its pages and its wonderful stories. The original photographs are beautiful, and there are also well-chosen images from the British Library and the Welcome collection, as the author explains in his acknowledgements. The writing is supple and I’d dare say it will appeal to a large variety of people, because although it is not perhaps addressed at botanists or experts, it shares plenty of anecdotes and stories likely to interest most readers. Will ever after handsome be (Wills, 2018, p. 67). If you try it and it works, don’t forget to let me know! I enjoyed the pictures, the stories, and I became convinced as I read the book that I’d like to read more of the author’s works, and I’d love to attend one of his lectures. Of course, he had me at the acknowledgements already, when he mentioned his dog, Max (oh, don’t worry; there’s a picture of him too). “Finally, I would like to thank Max, to whom this book is dedicated, for allowing me to frequently stop his walk and take photos of trees. He’s very tolerant” (Mills, 2018, p. viii). In sum, this is a beautiful, informative, entertaining, and amusing book that will delight all those who love nature, trees in particular, and who enjoy trivia, stories and photographs. Perfect as a present, for yourself or others, as an inspiration, and as a breath of fresh air. Enjoy! Wills, S. (2018). 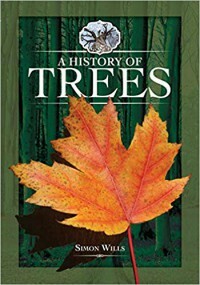 A history of trees. Barnsley, UK: Pen & Sword White Owl. A multitude of stories that make up a feel-good novel in an extraordinary setting. What did I like? The story made me think of the best soap operas centred in a community, where over a period of time we get to know the characters and we care for them. It shows the writer’s great skill that despite the episodic nature of the story, we feel quite close to the characters (some more than others, but still, they are all distinctive and feel real in their everyday preoccupations and lives) and care what happens to them. Iris, in some ways the central character, as she is the goddess of the rainbow in Greek mythology, is the messenger of the town, and no matter what her personal circumstances are she keeps delivering parcels, messages, and bringing her upbeat outlook and optimism to all she meet. She is a favourite of mine, and I was happy things worked out so well for her. But I became fond of most of the characters, even the less likeable ones, as we are offered enough information about them to understand them, and the good-will of the town and its people is contagious. The story is narrated in the third person but each chapter is told from the perspective of the main character it talks about, and that means we get to see them not only as others see them but as they truly are. Was there anything I didn’t like? As I said, I enjoyed the atmosphere, the character,s and their stories. I received a copy of the book, in paperback, a long while ago but hadn’t had a chance to read it. Therefore, it might be that the book has undergone revisions and transformations since, so my objections might well be unjustified now. The paperback had some formatting issues (no page numbers, some empty pages and strange distribution of text), there was the odd typo here and there (nothing too jarring even for an early copy), and then there were some peculiarities in the way the story was told. As a non-native English speaker, I am always wary of commenting on style. In this case, I wondered if some of the grammatical structures that sounded slightly odd to me might be an attempt at adopting the rhythm of conversations and speech in Greece, and I soon became accustomed to it and got to like it, but I’d advise readers to read a sample of the book first, to check for themselves. Thanks to Rosie and the whole team at Pen & Sword for providing me a hardback copy of this gorgeous book that I freely chose to review. 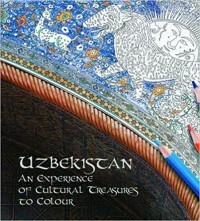 1) Architecture: with photographs of ancient temples, palaces, and modern mosques and other buildings, with brief explanations of the history and the significance of the building, in one page, and in the opposite page, the drawing to colour (in some cases of the reconstruction of the ancient building). 2) Murals. (Here I loved the winged horses and the beautiful geometrical ceiling decorations). 3) Ganch carvings. Intricate and beautiful, this section includes several pages of designs for free colouring, without corresponding photographs. In case you are not familiar with ganch carvings (I didn’t know the name but recognised it when I saw pictures), you can find more about it here). 4) Mosaics. Here, there are some deceptively simple and some incredibly detailed (like the one featured in the cover of the book). I’m a big fan of mosaics and loved this section. 5) Glazed bowls. If you love pottery, I’m sure you’ll enjoy this one. 6) The textiles section includes some richly coloured woven carpets, amazing dresses (iroki embroidery) and gowns. 7) Paintings. These are fairly recent and incredibly beautiful as well. Although there are some fairly modern in style, others make one think of the Arabian Nights. DNF at 48%. Liked the characters but it needs a good edit and I think it would work better if it was clearly targeted at a younger audience. Recommended to lovers of Rock & Roll, music, and the 1970s rock scene. Thanks to NetGalley and to Random House UK, Cornerstone, for providing me an ARC copy of this book that I freely chose to review. I kept seeing this book pop up all over when it came to recommendations of new releases and that made me curious. I also read that Reese Witherspoon had bought the rights to adapt it into a TV series, and the comments about the book made me think about the movie This Is Spinal Tap, although the musical genre is different (yes, it’s all Rock & Roll, baby) and the story is not intended as a parody, and all that together with the evocative cover, I knew I had to check it out. This is one of those novels where I was intrigued to read what other reviewers had said, and, curiously enough, one of those where I could see the point of both, those who really loved the book, and also those who hated it. Somehow, I could see the merit on both types of opinions, and it really depends on the kinds of books you enjoy or not. A couple of provisos, here. Many of the reviews talk about the author, and especially refer to one of her previous books, The Seven Husbands of Evelyn Hugo, which seems to be a well-loved novel, and for people who had loved that book, their expectations were very high, and some found this book too different (some fans of the writer also loved this book, so don’t let that put you off). I haven’t read any of the author’s previous novels, so I cannot help with that. After reading the reviews and this novel, I became curious about her other books, but I come to it without any previous knowledge. The second proviso is that quite a few people compare the ‘fiction’ band at the heart of the story, The Six, that is later joined by Daisy Jones, with Fleetwood Mac (with Daisy Jones then being a stand-in for Stevie Nicks), but I must confess not to know enough about the ins and outs of this band to be able to comment (I was quite young when they were at the height of their popularity, and I never read much about them, although having read a bit about them since, yes, I can see similarities, but I can also see differences). 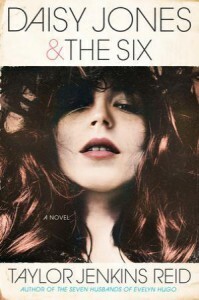 So, if you are a big fan of Fleetwood Mac, you might be more intrigued to read this novel, but you might also hate it. You’ve been warned. So, what are the comments on both sides that I agree with? The way the story is told will not be to everybody’s taste. This is the story of the band, and of Daisy Jones, pieced together through interviews conducted many years after the band was created, and that makes it very fragmented. It does follow a chronological order, and we get to know about Daisy Jones, and about the Dunne Brothers (Billy and Graham), from before they got into singing, composing, and playing songs, and later on the rest of the members of the band, Camila (Billy’s girlfriend and later wife) and their manager also come into play. These fragments of interviews often refer to the same events, providing the reader different points of view, and sometimes completely different descriptions, but it can cause a disjointed effect, and it will suit some readers but others will hate it. Personally, I found it fun and quite dynamic, but it is true it does not immediately create a picture of what’s going on in one’s head, in the same way as more standard narratives do. There were also a lot of comments about the characters, and how some of them were one-dimensional and it was difficult to tell them apart. As I have said before, the story starts with the origin of the band (we later learn why), and then we only get to hear from the rest of the members as they join the band or meet the other characters. For me, Pete, Eddie and Warren were not distinctive enough. Yes, Eddie always seemed to have issues with Billy and didn’t like his style of leading the band. Pete had a girlfriend in the East and he would phone her often, and Warren was the drum player, but other than that I’m not sure I got a strong impression of who they were, and when later in the book one of them wanted to leave the band, I realised that I must have been told two of them were brothers already, but because that hadn’t feature prominently anywhere (after all, the interview is about the band, their tours, and their records, and the questions asked are mostly about the time they spent together), it had not registered with me. Camila is talked about a lot, because many of Billy’s songs are about her, and although she seems to represent an old-fashioned model of femininity, the staying-at-home Mom, she gets involved at crucial points and she has a more important role than one might think when the story starts. I did feel that the female characters were the strongest, and although that did not make them immediately sympathetic and likeable, I thought they were the more complex and the ones I most enjoyed. I liked Karen (I’m not a musician, but I did feel a connection with her) the keyboard player, as well, and she is, perhaps, my favourite character. And I quite liked Daisy’s friend, Simone, also, although she is mostly portrayed as her friend, rather than being an individual in her own right, and that comes in part from her telling Daisy’s story and her role in it rather than giving us much insight into her own character. Although Daisy marries at some point, Simone is more of a steadying influence for her, like Camila is for Billy, than any of the men she meets and talks about in the book. But I agree, the way the story is told does not make for fully rounded characters, although many of the situations will feel familiar to people who have read a lot of biographies of rock & roll bands. Some reviewers were disappointed by the ending, that perhaps feels more like a whimper than a bang, but I thought it made perfect sense, and yes, there is something I’ve seen described as a twist, that is perhaps not truly a twist, but it helps join everything together and adds a nice touch. I am not an expert on music, and not a big follower of bands. I have not been to many concerts, although even with that, it is difficult not to have heard or read about the use of drugs, wild parties, hotel rooms trashed by bands on tour, groupies following bands from city to city, and the paraphernalia around the 1970s world of rock & roll music scene. There is plenty of that here, and also of envies, of fights, of creative differences, of the process of composing, creating, and editing an album, down to the shooting of the cover, that will delight people who really love the period and reading about it. Even I, who am not knowledgeable about it, enjoyed it, particularly learning more about the process of creation, although it might not sound authentic to people who truly know it. The writer gives the different characters (at least the main ones) distinct voices, and the lyrics of the songs, that are also included in full at the end, fit perfectly in with the band and its themes, and it made me keen on reading more of the author’s novels. There is more than R & R to the book, or perhaps some of the themes seem inherently related to it, like drug addiction, family relations, alcoholism, abortion, fatherhood, bringing up children, the role of men and women in the family, child neglect and abuse… Although some of them are only mentioned in passing, we get a fuller picture of others (Daisy is very young when she leaves her parents and starts visiting bars, taking drugs, and engaging in behaviours that would be considered risky at a much older age, and drug and alcohol addiction and its consequences are discussed in detail), and readers must be cautious if they find those subjects upsetting. I have talked a bit about the characters and said which my favourites are. In some ways, Billy and Graham are the most sympathetic to begin with. Their father abandon them when they are very young, and they work very hard, are talented, and support each other through thick and thin. However, when Billy becomes addicted to drugs and then gets sober and becomes the head of the band, he puts himself and his family first and is not always likeable (even if creatively he sounds interesting). Daisy, on the other hand, sounds at first like a rich-spoiled girl, but her family pays no attention to her, and she is in fact neglected. She is selfish and egotistical as well, but she has no role models or understanding. I liked her attitude, but not her in particular, at least at first, and her behaviour will be alien to most people (although typical of the image we might have in our head about what a rock star would be like). However, the way the story is told gives us the opportunity to read her later reflections and the way she now sees things and how she evaluates much of what she did at the time. And although I didn’t particularly like the Daisy of the period (she is described as a magnet to everybody who met her, but I never had the feeling I would have liked it if I had known her), I came to appreciate the older Daisy and her take on things. 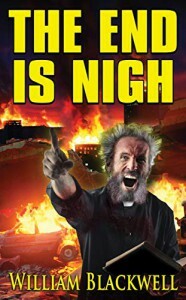 What did I think of the book? I really enjoyed it. It panders to most of our standard images of what the life of a rock & roll band would have been like at that time, but it gives an insight into parts of the process that I found interesting. It also creates some credible female characters that have made their own decisions and fought their own fights, and in the world of music that is not always easy to find. The way of telling the story worked for me, although I know it won’t work for everybody. I highlighted a lot of the story, so much so that I decided to leave it to readers to check a sample and get a sense of the narrative style. Does it deserve the hype? Well, perhaps not for me, but it’s a good read and I can see why it will captivate some readers more than it did me. Oh, and for those who love audiobooks, I’ve read very good reviews of the audio version, and I understand that there is a full cast of narrators and each character is voiced by a different person, so it is worth considering. If you are a rock & roll fan and enjoy trips down memory lane, especially to the 1970s, I’d recommend this book. And I hope to explore further novels written by the same author. DNF at 35%. I don't read many YA novels and although I thought the plot sounded interesting, it is not for me. And the ARC needs a good edit as well. That didn't help either. There is always a price to pay. 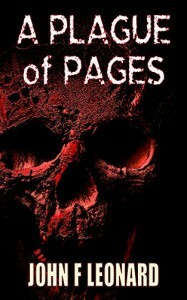 A fun and fast horror novella. I recently read another one of Leonard’s stories from the Dead Boxes Archive, Call Drops (you can find my review here), thoroughly enjoyed it, and could not resist reading another one in the collection. Much of what I said about the previous story applies to this one. Yes, if you love the Friday the 13th series, The Conjuring, The Twilight Zone, and Alfred Hitchcock Presents, you’re likely to enjoy this. But, this is horror, and this story, more than the previous one, goes into fairly gore detail. I won’t spend too long rehashing the plot of the story, because if you’ve read the author’s description you already know what is about. Anthony is a man who’s lost everything (well, not quite everything, as it turns out), and decides to try his hand at writing. Well, we’ve all been there (not perhaps having lost everything, but thinking about becoming a writer). That he decides to go old school and use pen and paper is more surprising, but his father dealt in antiques and he has an interesting heirloom to put to good use. Or bad. Of course, things take a turn for the weird soon enough. The story is told in the third person, mostly from Anthony’s point of view, although, interspersed in the novella are some chapters that follow the investigation into a very strange streak of crimes. In fact, the book starts with one of the most bizarre crime scenes I’ve come across (and yes, I read a lot of thrillers, so that’s saying something). A word of warning: if you are of a sensitive nature, especially when it comes to libraries and librarians, you should look away. But don’t worry. I won’t describe it. Those chapters of the story, told from the point of view of Detective Sergeant Shadwell, Adi, read like a standard thriller, with the case-worn detective, the less than politically-correct policeman, the uninterested boss, and will probably feel familiar to those who read in that genre. Adi is a likeable character and shows a good deal of patience and resilience, but we don’t get to know him too well. This is a novella, after all, and most of it is taken up by Anthony’s events. 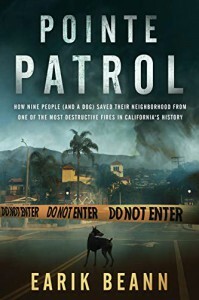 You’ll probably suspect that the two seemingly separate parts of the story are interconnected in some way or other, even though the first chapter is set up “After the Handfield Tragedy” (yes, foreshadowing or what?) , and then we go back several months to get to the main action of the book. After that opening, we take up the story of Anthony, which starts innocuously enough, like many other stories you might have read about people who’ve lost everything and quickly fall into a hole, unable to find a way of slowing their downward spiral. But there is the pen, and strange things start happening quickly. Although the story and the cards he has been dealt might make Anthony sound sympathetic, and he experiences things that would have made anybody feel unhinged, this feeling, at least for me, did not last long. Yes, he protested and claimed to be shocked for what he might have unwittingly caused, but it soon became evident that he showed no true empathy for anybody he met, and he was more preoccupied for himself and his own safety than for that of others. He seems to always think in clichés, platitudes, popular and old sayings, and proverbs, as if he did not have a single original thought in his head, and when we hear from his father, it seems that this is a family trait. As was the case in the previous story, it seems that the objects belonging to the Dead Boxes choose their owners well, indeed, and seem able to dig deep into the characters’ psyche and uncover less than flattering characteristics. I enjoyed the story, although as was the case with the previous one, I wouldn’t recommend it to people who don’t enjoy horror or graphic violence. It is not a story likely to make you jump, but it builds up pace, and the events get more horrific as you read on (well, after the shocking start). The interim chapters from the point of view of the investigator (also written in the third person) give the reader a bit of a break, a touch of normalcy, although due to the nature of the crimes, this is relative. I felt this novella is more likely to satisfy readers who like a sense of closure and explanation than Call Drops. We get more information about the item itself, and there are hints at the full mythos behind the Dead Boxes, which grabbed my attention. And the ending… Well, readers have known from the beginning that something big was coming, but not necessarily what. Yes, it worked for me. There was always a cost. That was how everything worked. Supernatural or humdrum day to day. It was all the same. You could get some goodies so long as you were willing to pay. Leonard delivers again. I look forward to more stories from the Dead Boxes Archive. Thanks to NetGalley and to Virago for providing me an ARC copy of this novel and allowing me to participate in the blog tour for its launch. I freely chose to review it, and I’m very happy I did. I am sure you will have noticed the beautiful cover and it might give you a hint of what the book is about. Yes, the book is about Vincent Van Gogh; well, about his art and his paintings, and the controversy that followed the sale in Germany in the 1920s of some of his paintings, which later were identified as fakes (well, perhaps, although the controversy about some of Van Gogh’s paintings, even some of the best-known ones, has carried on until the present). But that is not all. 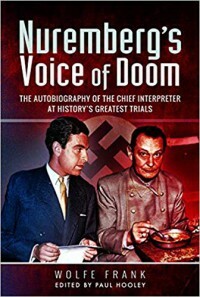 The story is divided into three parts, all set in Berlin, each one narrated from one character’s points of view, and covering different historical periods, although all of them in the interwar era and told in chronological order. The more I thought about it, the more I felt that the author had chosen the characters as symbols and stand-ins for each particular part of that period of the history of Germany they represented. By setting the story in the 1920s and 30s, in the post-WWI Germany, we get immersed in a rapidly changing society, and one whose political developments and social unrest share more than a passing similarity with some of the things we are experiencing internationally nowadays. This section of the book establishes the story, and introduces many of the main players, not only Julius, but also Matthias, a young man Julius takes under his wing, who wants to learn about art and ends up opening his own gallery; and Emmeline, a young girl who refuses to be just a proper young lady and wants to become an artist. Julius is an intelligent man, very sharp and good at analysing what is going on around him, but blind to his emotions and those of others, and he is more of an observer than an active player. His most endearing characteristic is his love and devotion for art and artists, but he is not the most sympathetic and engaging of characters. He is self-centred and egotistical, although he becomes more humanised and humane as the story moves on. The second part of the novel is set in Berlin in 1927, and it is told, again in the third-person, from Emmeline Eberhardt’s point of view. Although we had met her in the first part, she has now grown up and seems to be a stand-in for the Weimar Republic, for the freedom of the era, where everything seemed possible, where Berlin was full of excitement, night clubs, parties, Russian émigrés, new art movements, social change, and everything went. She is a bit lost. She wants to be an artist, but does not have confidence in herself; she manages to get a job as an illustrator in a new magazine but gets quickly bored drawing always the same; she loves women, but sometimes looks for men to fill a gap. She can’t settle and wants to do everything and live to the limit as if she knew something was around the corner, and she might not have a chance otherwise. Although she gets involved, somehow, in the mess of the fake paintings (we won’t know exactly how until much later on), this part of the story felt much more personal and immediate, at least for me. 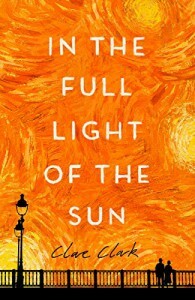 She is in turmoil, especially due to her friendship with a neighbour, Dora, who becomes obsessed with the story of the fake Van Goghs, but there are also lovely moments when Emmeline reflects on what she sees, and she truly has the eye of an artist, and she also shares very insightful observations. I loved Dora’s grandmother as well. She cannot move but she has a zest for life and plenty of stories. The third part is set in Berlin in 1933 and is written in the first person, from the point of view of Frank Berszacki. He is a Jewish lawyer living in Berlin and experiences first-hand the rise to power of the Nazis. He becomes the lawyer of Emmeline’s husband, Anton, and that seems to be his link to the story, but later we discover that he was the lawyer for Matthias Rachman, the man who, supposedly, sold the fake Van Goghs, the friend of Julius. As most people who are familiar with any of the books or movies of the period know, at first most people did not believe things would get as bad as they did in Germany with Hitler’s rise to power. But things keep getting worse and worse. His licence to practice is revoked, and although it is returned to him because he had fought for Germany in the previous war; he struggles to find any clients, and the German ones can simply choose not to settle their bills. He and his wife have experienced a terrible loss and life is already strained before the world around them becomes increasingly mad and threatening. When his brother decides to leave the country and asks him to house his daughter, Mina, for a short while, while he gets everything ready, the girl manages to shake their comfortable but numb existence and has a profound impact in their lives. Although I loved the story from the beginning, I became more and more involved with the characters as it progressed, and I felt particularly close to the characters in part 3, partly because of the first-person narration, partly because of the evident grieving and sense of loss they were already experiencing, and partly because of their care for each other and the way the married couple kept trying to protect each other from the worst of the situation. I agree that not all the characters are sympathetic and easy to connect with, but the beauty of the writing more than makes up for that, as does the fascinating story, which as the author explains in her note at the end, although fictionalised, is based on real events. I also loved the snippets from Van Gogh’s letters, so inspiring, and the well-described atmosphere of the Berlin of the period, which gets more and more oppressive as it goes along. I found the ending satisfying and hopeful, and I think most readers will feel the same way about it. This is not a novel for everybody. It is literary fiction, and although it has elements of historical fiction, and also of the thriller, its rhythm is contemplative, its language is descriptive and precious, and it is not a book where every single word moves the plot forward. This is not a quick-paced page-turner. Readers who love books that move fast and are heavy on plot, rather than characters and atmosphere, might find it slow and decide nothing much happens in it. There is plenty that happens though, and I could not help but feel that the book also sounds a note of caution and warning, because it is impossible to read about some of the events, the politics, and the reactions of the populations and not make comparisons with current times. As I sometimes do, although I have shared some quotes from it already, I’d advise possible readers to check a sample of the book before making a decision about it. This is not a book for everybody. If you enjoy reading as a sensual experience, appreciate the texture and lyricism of words, and love books about art that manage to capture the feeling of it, I cannot recommend it enough. It is beautiful. This is the first book by this author I’ve read, and I’m sure it won’t be the last. Recommended to those who love horror, psychology, historical police procedurals and a different take on serial killers. Thanks to NetGalley and to Little Brown Book Group UK, for providing me an ARC copy of this book that I freely and with some trepidation chose to review. There is much to talk about in this book (yes, I enjoyed it, if you want the short of it. Yes, it is eerie, gothic, can be scary at times, it is full of evil deeds, some not apt for the fainthearted, and full of atmosphere), and it would also be easy to fall into revealing spoilers, so I will try to talk in general terms and will keep some of the thoughts that went through my head as I read it to myself. The main engines that drive the story are Jungian psychology, Central European myths and legends, the history of Czechoslovakia immediately before the Second World War and the ethnic tensions that existed within the country at that time. This is 1939, and the author is great at bringing to life the atmosphere in Czechoslovakia at the time, the politics and the strained relationships between the different parts of the population, the ethnic minorities, the Germans, Sudeten, the Jewish inhabitants, the criminal underworld, and the increasing atmosphere of threat and impending doom and evil. He also uses the locations, both in the city, the forests, and the castle, to great effect, to the point where they almost become protagonists in their own right. I can’t say I’m familiar with any of the locations of the story despite a visit to Prague many years back, although there are some, like the Bone Church (the Sedlec Ossuary) that have intrigued me for many years, and I am sure I’m not the only one who shares in the fascination. Having worked as a forensic psychiatrist, I could not resist the idea of reading a book set in what would have been a forensic unit of the time. And what a setting! A castle that according to legend was built to keep closed the entry to hell and that now houses the six most dangerous insane criminals of all central Europe. Both, the director of the hospital and the new doctor we meet on his way to take up his new appointment, Viktor, (no, you won’t make me tell you what happened to the previous psychiatrist in the post, don’t insist) have interesting theories to explain the madness of their patients (one akin to a contagion, like that caused by a virus, the other a similar concept to that explored and exploited often in movies and films, but in this case referring to a specific aspect of one’s personality, the so-called “Devil Aspect” of the title, rather than to multiple personalities), and the book goes into a fairly detailed explanation and exploration of those theories, including allowing us to witness the doctor’s sessions using narcotics (a very dangerous technique, I must say). I found these part of the book as fascinating, if not more, as the other part that seemed to be the more active and thrilling part of it, but I am aware that there is a lot of telling (because each one of the six devils gets a chance to tell their story), and although they help give a global picture of the nature of the evil the book refers to, not all of them seem to be directly related to the plot of the book, so guess that some readers will not feel the same as I do about those sessions. The second part of the action, which takes place in parallel, consists of the investigation of a series of crimes in Prague, committed by a murderer, Leather Apron, who seems intent on imitating Jack the Ripper, and we follow the efforts of a police investigator Lukas Smolàk, trying to catch him. This part of the book is more akin to a police procedural of the time and is well done. It feels like a noir detective novel, only set within a gothic nightmarish background, not so dissimilar to the Victorian Ripper original. The clues are gruesome and so are the murders, and every time they seem closer to solving the crimes, something new comes to light and confuses matters. 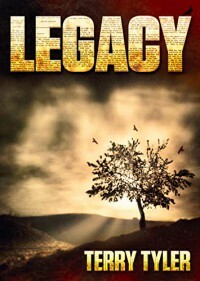 While to begin with Lukas appears to be the example of a seasoned detective who has seen everything and is wary of events in society at large, later the murders start to affect him more personally, and he becomes increasingly unravelled by the events, which humanises him and makes him easier to connect with. The story is told in the third person but from each one of those characters’ points of view, with some brief intrusions from other characters’ insights, like one of the victims, or Judita, who is a bit more than a friend of Viktor and also works at the hospital. This works well to give us a better understanding and makes empathise, and also suffer with them, in some cases. Personally, I really liked Judita, who has to face prejudice and has overcome her own mental health difficulties, and also Lukas, who shares with Viktor the determination to find the truth, and the analytical mind. I was intrigued by Viktor, not only because he is a psychiatrist, but because we learn from early on that he has survived a pretty difficult childhood and has had to cope with trauma. But his single-mindedness and his pursuit of his theory, sometimes despite the evident risks, not only to himself but to others, give him a tinge of the mad scientist, and I found him more interesting as a subject of observation than as somebody I felt connected to. The Central and Eastern European mythology and the Jungian psychology theme add a further layer of complexity and work well in helping bring more uncertainty, menace, and confusion to the proceedings. There are dark corners and many secrets hidden by most of the protagonists; there are clues and warnings aplenty, red herrings, twists and turns, and although readers of the horror and the psychological thriller genres might have their suspicions and a variety of theories as to what is going on, a bit like the layers of the personality Viktor tries to reach, the narration also pulls us deeper and deeper into the darkness, the plot, and the castle, which is a physical stand-in for the deepest recesses of the human mind and also of human history. 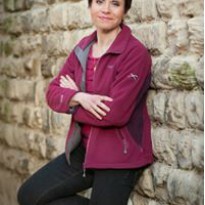 I enjoyed the style of writing, full of vivid imagery and very atmospheric, which makes us see what is happening in our minds (sometimes even when we’d rather not), and felt the rhythm worked well, combining the investigation, that felt more pressing and hurried, with what was happening at the castle, that at least, to begin with, was more contemplative and serene. The closer we come to the end, the more the rhythm accelerates and both strands of the story come together. 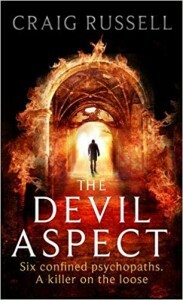 As I said, there is a twist, or even more than one, in the end, and I think this book has everything to recommend it to readers of the genre who also enjoy a gothic setting and are eager to explore new mythologies regarding good an evil. This is not a book I’d recommend to those who don’t enjoy horror and reading about violent crimes. 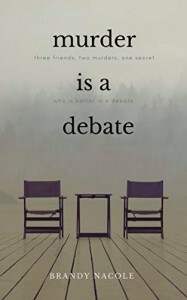 And it is not a book for those who prefer books fast and full of action, but it pays to stick with it, and if you’re interested in psychiatry and are looking for a different twist on the serial killer subject, I thoroughly recommended. I am not surprised film production companies are looking at buying this book. This could become a fascinating movie.